An overflow of over 1000 people coming together in prayer, reflection, solidarity and strength touched everyone very deeply who as we came together to bear witness to the tragic events that have unfolded in New Zealand. 49 people worshiping during Friday Juma prayers were brutally Murdered and many more injured and wounded in an act of unprecedented terrorism in the region that has had a devastating effect on people’s from all faiths and walks of life worldwide. Terrorism has no religion and in our place of prayer people of all faiths came together to offer their thoughts, words, poetry, and prayers with the many affected by this horrific, shocking and senseless tragedy. There are still many questions that remain unanswered, painful and hard conversations that will have to be had with respect to our safety in our private, public and sacred spaces... on this day we gathered in strength to comfort each other. We were particularly honoured by the many members of our New Zealand community including NZ Consulate General Nick Fleming and self described Random New Zealander’s and Kiwis offering prayer, poetry and song in an emotional outpouring that included members of our many interfaith and secular communities. For me in particular, this brought many memories and deep gratitude for the pioneering work of my Father the late Riasat Ali Khan and the many elders of ours and many communities who worked tirelessly for an inclusive and multicultural society that we can all live and love in together. Their inspiration will live on always. 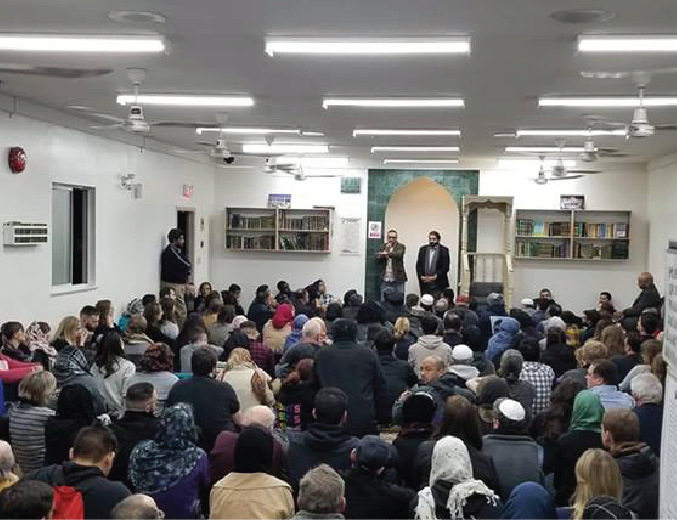 I would like to acknowledge Shafqat Bajwa who in his nearly 50 years of service to our Mosque and community came forward to speak to all those assembled with his thanks and well wishes. We felt the personal pain of our own Shaukat Khan, President of Pakistan Canada Association who lost his High School classmate Naeem Rashid who along with his son lost their lives in this horrific terrorist attack. We would like to give thanks to the many members of the Vancouver Police Department including Howard Koch Deputy Chief Constable and the VPD team keeping us safe with rolling patrols throughout the day as well as Gareth Blount of the RCMP and Canada’s security agencies monitoring the situation. 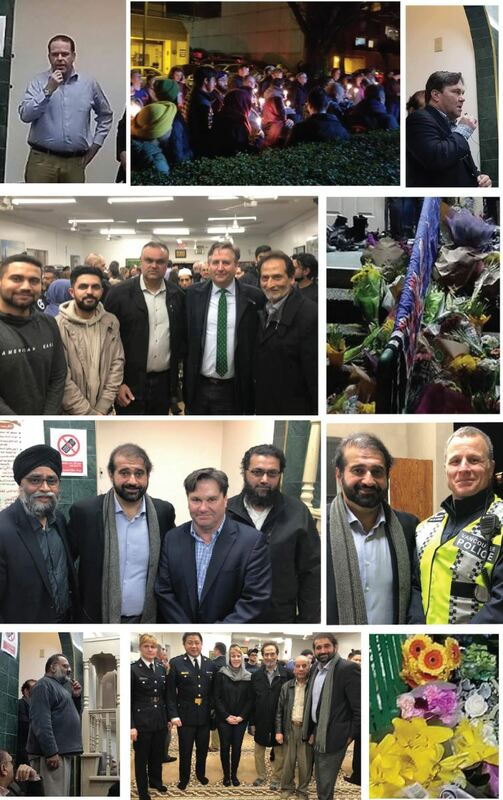 Ravi Kahlon, representing Premier Horgan and Province of BC, MLA MIchael Lee, Members of Parliament, Don Davies, our own Member of Parliament Jody Wilson Raybould and our Minister of Defence Harjit Sajjan spoke with great eloquence and in solidarity with all of our communities. The many speakers from all faith and backgrounds who came forward and stretched through the late evening raised their voice in speech and song and brought comfort, tears and much needed laughter to all those assembled. Truly, an unforgettable experience. We will make another release honouring all who came and spoke along with video from the event. A funeral prayer for those far away and so close to all of us. Board and Trustees Pakistan Canada Association- Al Jamia Masjid Vancouver Jamil Chaudrhy, Tariq Tyab, Islam Unravelled, Abubakar Khan, Raza Mirani, Iltaf Sahib, BCMA, Harpreet Singh, Imtiaz Popat, Anwar Latif, Rabbis: Phillip Bregman, Dan Moscowitz, Hannah Dresner, and Adam Stein, Mira Oreck, Michael Magee, Sadhu Johnson, Teresa Jong, CBC, City TV, BCTV, CKNW, Al Ameen Post, Miracle News, Canada Community Times, Vancouver Sun, Globe and Mail, the many friends, families and volunteers who made this evening a night to remember and cherish.